The Phendrana Underground Lake Area is one of three main sectors in the Phendrana region on Tallon IV. The other major sectors are the Space Pirate research outpost, Glacier One, and the Shorelines area, which encompasses the Chozo Ice Temple and other ruins. The Underground Lake Area is comprised of the deeper reaches of Phendrana which are only accessible through the Frozen Pike. The Pike itself is accessible through the Research Core of Glacier One or via the Quarantine Cave. 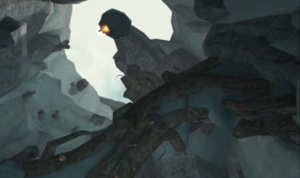 Notable rooms in this area include the Hunter Cave, the Frost Cave, Phendrana's Edge, and the Gravity Chamber, where the Gravity Suit upgrade is acquired. Though this area is never explicitly named in-game, it is easily distinguishable from other areas in Phendrana Drifts by the unique soundtrack that plays in the area. This soundtrack was only named in the Official Metroid Prime & Fusion Original Soundtracks, and only in Japanese. The title of this track, number 24, in Japanese is "アイスバレイ（フェンドラナ地底湖エリア," or Ice Valley (Phendrana Underground Lake Area). Many sites translate this track as "Phendrana Deep Lake Area," but this stems from inadequate translation programs rendering 地底 (chitei: depths of the earth) and 湖 (mizuumi: lake) as separate words, rather than as the unique phrase 地底湖 (chiteiko: underground lake, subterranean lake).